As mentioned previously, A's brother K is a bit of a gastronome, and he and his girlfriend J showed A and C a phenomenal time in Leeds the other weekend. 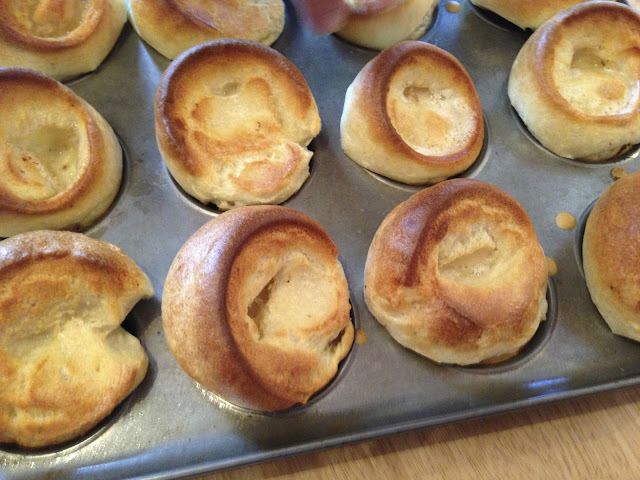 Not to be upstaged, however, we decided to take a little bit of Yorkshire gourmet (not rhubarb) back to London to produce something special. 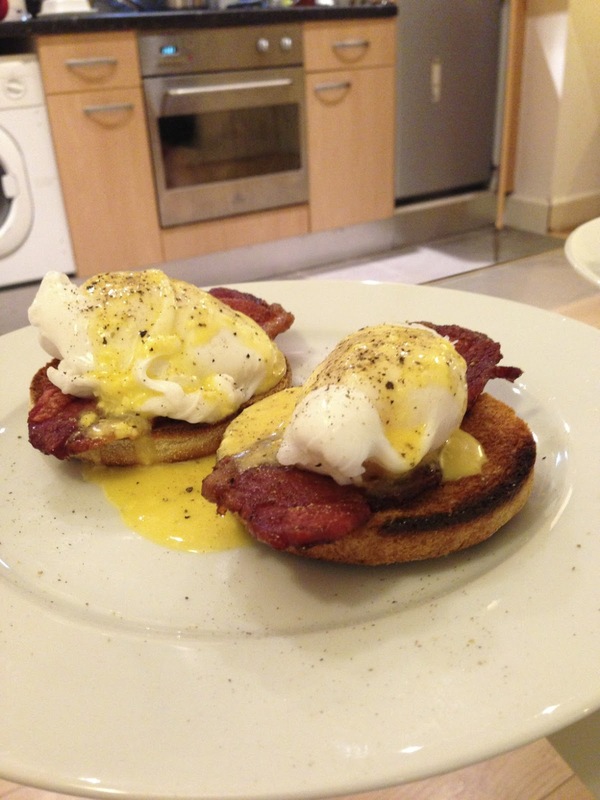 A had always wanted to have a go at making his own eggs benedict and, armed with half a dozen duck eggs picked up in the North, he spotted the perfect opportunity to push the boat out and make himself and C a gourmet version of what's already quite an extravagant dish. K directed A and C to a specialist egg retailer in the Leeds covered market who sold everything: hen's eggs of every conceivable size and colour, double yolkers, quails eggs and duck eggs. After being made to feel somewhat uncomfortable by the stuffed chicken with the glassy eyes (C, in particular, is extremely disturbed by taxidermy), we came back armed with half a dozen fresh duck eggs. The following weekend back at home, A set to work producing a wicked hangover cure after C had spent a chunk of the morning complaining about a sore head after a rather raucous 1920s-themed party with A the night before. It was A's first time cooking with duck eggs, and both he and C were surprised at a few of their attributes. First, they are actually quite large. Second, duck eggs have a rather thicker shell than hen's eggs, meaning you have to apply a little more force to get into them than you would a hen's egg. Third, the yolk inside a duck egg is significantly bigger than that of a hen's egg (the combination of attributes two and three is quite scary in the context of trying to get into the egg without breaking the yolk: A was terrified as there were no extras). 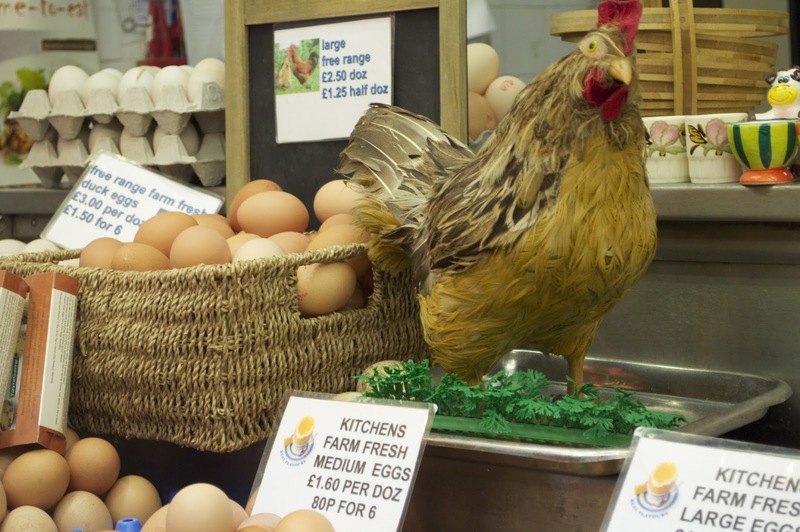 Fourth, the flavour is different: a duck egg is significantly richer than a hen's egg. A poached his eggs the old-school way in a pan full of hot water with a dash of vinegar. 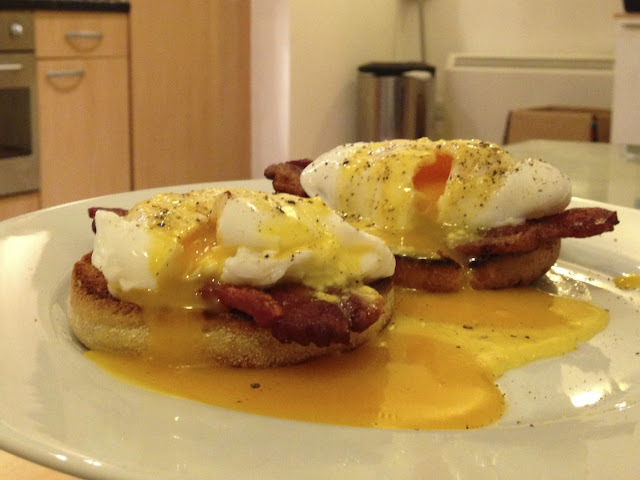 New to this method of poaching (A grew up in a house with an egg poacher), he took a couple of practice runs at it with hen's eggs in order to get it just right for the precious duck eggs. 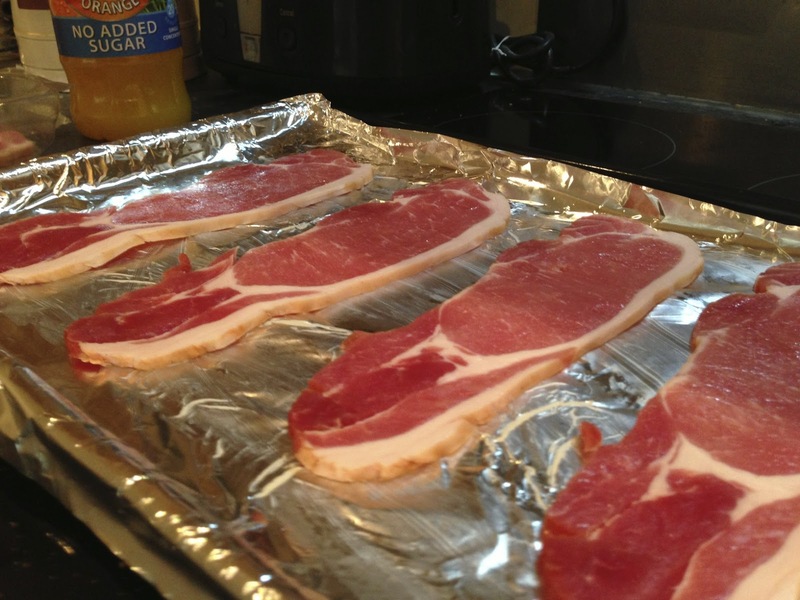 A also used bacon as opposed to gammon steaks to top the muffins: he understands that the original eggs benedict was made with bacon and wanted to repeat the original. Actually, why lie? A and C like bacon. A lot. As we had four muffin halves there were a couple of eggs for the sauce and A made a hollandaise by adapting Mark Bittman's recipe in How to Cook Everything to fit duck eggs (essentially using two rather than three yolks because of the size of the eggs - and because he only had 2 eggs left). For those of you who have not made it, hollandaise sauce is virtually foolproof: an emulsion of egg yolk, a dribble of vinegar, water, butter and a pinch of salt, which you warm very slowly over a low heat until it thickens a little. The only thing you need to watch out for is heating too aggressively, as you'll end up with an omelette if you do. It's a sauce that lends itself very well to spices and herbs; in A's experience, dill and cayenne pepper work very well (though probably not together). The results were excellent: warm fluffy white pillows full of rich yolks, which oozed onto the plate when punctured. The mix of creaminess (egg and sauce) and saltiness (bacon) made for a divine combination and the crunchiness of the grilled bacon and toasted muffin was offset perfectly by the soft consistency of the eggs. The difference from hen's eggs was palpable, too, with the duck egg having a far greater richness and intensity of flavour. In short, the indulgent twist we were expecting from using the duck's egg worked out better than we hoped for and it was certainly an A* grade hangover cure. Next time we see duck eggs on sale, we know what we're doing with them! What a great post - this looks absolutely scrummy! Thank you Michelle, They really were!